My title my be a bit surprising considering the bad rap God’s wrath has gotten in recent times. I recall growing up and having a lively, and misguided, preacher practically scare the you know what out of me. These preachers usually cite such passages as 2 Thessalonians 1.5-10, Christians are then made to fear the wrath of God or the coming of the Lord Jesus. Yet Paul’s intent or purpose in those passages is just the opposite of my preacher: Paul says of the coming of the Lord, for example, that we “encourage one another” with this hope (1 Thess 4.18). Further, Paul is writing to lift the spirits of the down trodden and persecuted Thessalonians by reminding them that God will deal with his enemies and the enemies of his People. In Thessalonians it is those who don’t know God, those who don’t know Christ, those who wage war on his people that are warned to beware! The wrath of God is not directed at his people in Thessalonians. Rather the Wrath of God is directed on behalf of God’s People! His coming in wrath proves that he is a God of love to his people in Thessalonians. Nahum, that book that has languished in the bowels of neglect and obscurity, can really help God’s People today to grasp the good news of God’s wrath. Nahum helps us to celebrate the wrath of God. Nahum deserves careful, thoughtful and reflective reading. Though piously affirming the “authority” of Scripture some preachers have recently, and shockingly, suggested that reading Scripture within its context is not necessary. Such a procedure functionally makes the whims of the preacher the authority rather than the text. But Nahum must be read with in its historical context and within the context of redemptive history in the Story of God. 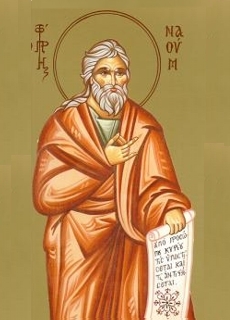 Nahum delivered his message between 663 BCE and 612. The Egyptian city of Thebes mentioned in 3.8 was destroyed by the Assyrians in 663 so that is the earliest it could have been preached. Nineveh was destroyed in 612 so that is the latest it could have been preached. Most scholars would place the book after 625 and that is a reasonable date. Assyria during the eighth and seventh centuries BCE was noted for its thirst for blood and debased cruelty. Its armies wreaked total destruction upon their captive’s lands, but they also systematically deported defeated peoples and replaced them with foreign populations. The northern kingdom of Israel suffered such a fate at the hands of Assyria when Samaria was destroyed in 722 BCE and for all intents and purposes disappeared from history forever. Assyria was the superpower of the day. She was a ruthless state. Her name become a synonym with terror. Nineveh was nearly an impregnable fortress, guarded by walls, moats, the River Khusar. The city was unsuccessfully besieged by the Medes in 614. The Medes were joined by the Scythians and Babylonians and after a two and a half month siege the wall was breached. The fighting was savage and intense as recent archeological investigation has shown. In our next installment we will look at the theological message of Nahum … whose name, interestingly, in Hebrew means comfort … has for his people and why it is called the good news of peace!!! One cannot say “nahum” without saying “comfort.” God is comforting his people because he is a God of loving and saving justice … what good news that is to his oppressed little band of people. This entry was posted on Tuesday, July 24th, 2007 at 4:59 pm	and is filed under Christian hope, Exegesis, Hebrew Bible, Hermeneutics, Ministry, Nahum, Preaching, War -Peace. You can follow any responses to this entry through the RSS 2.0 feed. You can leave a response, or trackback from your own site. I’m looking forward to the next installment. I, too, heard preachers scare us to death w/ God’s wrath and didn’t learn until many years later his wrath is on our behalf. Good stuff, Bobby. Keep going. The wrath of God is a cause for unbelievers to be afraid not the people of God. We should have a healthy respect for God’s wrath but what a joy to know that God vindicates His name and those who love Him by fighting against His enemies. Looking forward to hearing more about Nahum. The Assyrians were ruthless and didn’t appear to add much to culture. Well, there were those bas-reliefs with lions eating people and enslaved captives chained at the neck. And one other thing. They finally figured out that if you go to a city and kill everybody and cart off all the booty, there’s no one left to steal from for a very long time. On the other hand, if you don’t entirely decimate them, the survivors are mad as hornets and become a real pain in the neck. What to do? They hit upon the idea of moving the population to other places. Fertile places that needed people and economic development. That way, they’d be so busy trying to survive and then thrive, they’d have no time or interest in revenge. And their attachment to their previous ways and gods would wain. The Babylonians learned from this and added other features, like allowing the exiled ones to return. And without that, the Jews would’ve gone extinct. Great post once again. I believe and preach to the church that we as Chrisitans can know that we have eternal life and should live and celebrate the abundant life we have in Christ Jesus both in this life and the life to come. We should share the good news with others. The world must understand that God is merciful, gracious, loving. We must love the sinner and understand that behind every sin of man is the grace of God that is bigger than any man’s sin. Jesus in John 8 tells the adulterous women to doesn’t condemn the woman but tells her to go and leave her life of sin. Loving the sinner (us, mankind)(hatting the behavior, sinfulness). As a minister it is hard to preach hell and God’s wrath because it was so over done in the past but it is a reality for those who don’t accept Jesus as lord before the Lord returns, so we (Christians) have a responiblity to share the good new until he comes. Again, great post brother. You get me thinking. Jim McGuiggan has a STELLAR book entitled, “Celebrating the Wrath of God” that really made me repent of my former understanding. Is JMs book on Nahum? Bobby, Jim’s book is not about Nahum. Here is a link about his book. Bobby, that last link was too long. Here’s a better one. Click on the book and it will take you to a fuller explanation of the book. What a testimony to the power of God that those no one else can seem to touch are still accountable to him. No, I don’t remember him talking much about Nahum, but he loves Habakkuk. Can’t wait for the next installment. I wonder how God will display his wrath for those who have misrepresented his warth? Bob is right. The Jim McGuiggan book is excellent. And, so is the thoughts on God’s Wrath.